On January 20, 2014, an interim agreement over Iran’s nuclear program will go into effect. The agreement is a compromise between Iran and major Western powers reached on November 24, 2013. The terms of the agreement provide that Iran will scale back activities under its nuclear program, but not dismantle it entirely. This compromise has prompted criticism that the agreement will not prevent Iran from developing a nuclear weapon, begging the questions, is there an international right to enrichment, and will enforcement of this agreement be adequate? 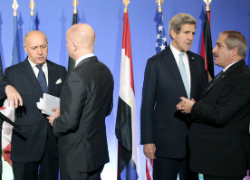 The agreement itself contains no explicit recognition of Tehran’s right to enrichment. While Iranian news proclaimed that it did recognize such a right, U.S. Secretary of State John Kerry emphasized that it did not. The question then turns on an interpretation of Article IV of the U.N. Treaty on Non-Proliferation of Nuclear Weapons, which Iran signed in 1968. It states, in part, that “[n]othing in this Treaty shall be interpreted as affecting the inalienable right of all the Parties to the Treaty to develop research, production and use of nuclear energy for peaceful purposes without discrimination….” Many countries have read this to create a right to enrichment, whereas the U.S. has taken the position that each case should be considered individually. This view is not in alignment with the other parties to the treaty. Moreover, the U.S. does not have authority to interpret the agreement unilaterally without ratification by other parties to the treaty. The other question raised following the announcement of the interim agreement was the means of enforcement and the consequences for Iran breaching the terms. Some of the International economic sanctions on Iran will be lifted as part of the agreement, and U.S. President Barack Obama said that the U.S. would give “modest relief” on sanctions on Iran, but would increase sanctions if Iran reneged on the deal. The International Atomic Energy Agency [IAEA] will play a central role in verifying that the terms are met. Reuters reported the IAEA as saying that there will be “…a significant increase in the frequency of inspections in Iran, access to more sites in the country, a need for more equipment and more analytical work….” The additional cost will come to around 6 million euros. The IAEA requested 5.5 million euros from its 160 member states to voluntarily help cover the expenses. The parties to the interim nuclear agreement are confident that the additional inspections and economic consequences of sanctions for the oil-dependent Iran will be sufficient to prevent the development of nuclear weapons. Despite the criticism surrounding the agreement, most notably from Israeli Prime Minister Benjamin Netanyahu, it remains a six-month interim agreement intended to provide additional time for negotiations to a final settlement in the decade-old nuclear dispute. The next few months will help elucidate Iran’s motivation for enrichment and any right that exists thereof. But perhaps it would also be beneficial to revisit the terms of the Non-Proliferation Treaty in the wake of the Fukushima disaster. Nuclear energy is no longer the golden child of clean energy when considering the progress of alternatives like solar, wind and hydro. The U.N. could consider clarifying Article IV to narrow the permissible scope of research and production of nuclear energy in recognition of its limited potential and substantial risk. [W]e have made concrete progress. I welcome this important step forward, and we will now focus on the critical work of pursuing a comprehensive resolution that addresses our concerns over Iran’s nuclear programme.